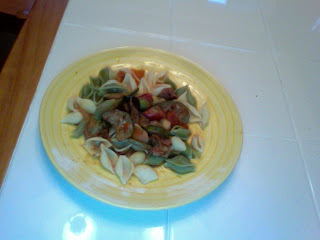 Chow and Chatter: What I Prepared Earlier! So we were going to have a busy afternoon ahead of us, dropping hubby at the airport and shopping he he. So I prepared some roasted veggies in fresh herbs and tomato sauce for later. This is a great tip, when you know your day is going to be busy cook ahead of time. When we returned after shopping and looking at Harley Davidson's, my parents want to buy one and keep it in my basement!, we were famished and little baby tired and hungry. I had cooked earlier so all I needed to do was boil pasta and there you have it, a healthy and tasty home cooked meal. I hope it stops raining so I can show them the sights and walk in the old beautiful neighbourhoods tomorrow. Nothing beats a homecooked meal! Hi! To say hello, this is my 1st visit to your your lovely blog. Is great! That's so great about pasta dishes, you can prepare the sauce in advance and have your meal ready in no time. I can imagine how excited you must be and enjoying your parents' visit. Looks like a delicious and healthy dinner. Hope it stops raining for you soon. Hello, nice to see your blog. thanks for your comment. Thanks for your visit and joining me. You are always welcome! Getting too much rain here, too. Always looking for new pasta dishes and that looks delicious. Deb: raining all over the US! and Hawaii! Ah shopping...one of my favorite hobbies! Love the roasted veggies!! I did buy a pack of those shell pasta!! (usually costs triple more expensive here) and some cuttlefish-flavoured pasta...I love to stir fry them with spinach and Chinese dried mushrooms.....simple, healthy and tasty! Looks delicious! Have you got the recipe? Girlichef: got a cute top for mum and baby! I always mean to make a dinner ahead of time on a busy day but somehow it never happens and I wait till the last minute :) Your dinner looks great!